Although most gamers these days don’t expect much from movie based games, however there have been a few which have broken this mould. Wolverine comes to mind but given the market of this game, Disney's G-Force needs to reviewed at its intended audience, the younger gamer and interestingly enough, the title is quite sturdy, boasts decent graphics and gameplay to boot! 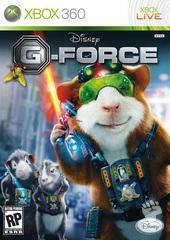 Loosely based on the movie, G-Force revolves around a group of special agents, however they are actually cute little gerbils and lead by the charismatic Darwin. The mission for these little hairy vermin is why harmless household appliances have somehow become deadly menacing robots. With mission in hand, it’s time for G-Force to investigate as they start their investigating in the home which leads to the Leonard Saber, the person who may be responsible as it is his company that have automated home appliances. The game is basically a 3D arcade game where the player must explore this environment, fight enemies and of course solve a variety of puzzles. As you control Darwin, he can perform all the classical arcade moves as he jumps and explores the environment. Thankfully the puzzles in the game are rather easy to solve, so younger gamers should have no problems at all. 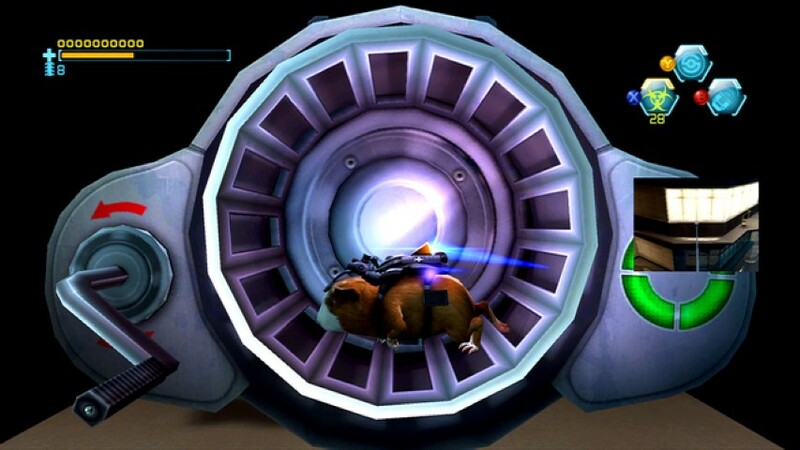 Also helping Darwin in the game is Mooch, a fly and his sidekick and by accessing the D-pad on the controller, Mooch can help Darwin reach places that he cannot. There is even “bullet-time” for Mooch which needs to be used when flying through blades etc… very cool indeed. Even though he has some weapons and basic spy gear, as Darwin progresses he will be given more powerful items to assist with the mission. 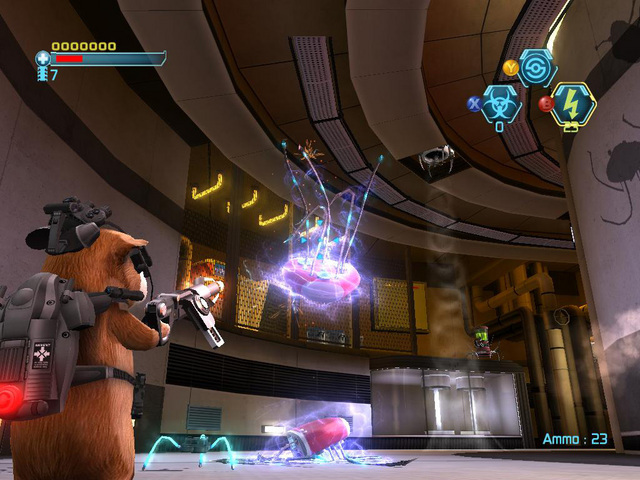 There is even a currency in the game or chips which can be used to purchase additional equipment from kiosks that are littered throughout the levels and is slightly reminiscent of Ratchet and Clank. Although our favourite weapon in the game was the flame thrower and seeing little Darwin use this piece of equipment was a blast. One of the cool spy devices is a scanning unit that allows you to scan items and enemies. For enemies, it also assists in showing them their weakness which is ideal for battles, more specifically boss fights. The combat in the game is quite diverse as you take on a variety of rogue appliances and I must admit that the control system on the XBox 360 works quite well. You can even setup hotkeys for weapons which is great for later levels when the enemies and environment changes. If you do become stuck in the game, maps are available at kiosks and the game will assist you by pointing you in the right direction should you become stuck. Graphically, the title is visually quite impressive on the 360, even though it has been designed for a variety of different consoles. Darwin, Mooch and his fellow characters are well animated and look almost like their movie counterparts. The game even uses cutscenes to progress the story along. The frame rate of the game manages to be quite decent throughout the game, however on certain levels, it does stagger a little. A cool feature in the graphic’s department is that you can even play the game in 3D, thanks to the 3D glasses which come with the game. Although it works, you do lose that great colour palette of the game but for those that like 3D, why not. The music, voice acting and sound effects of the game are decent as well and there are some really memorable moments in the game which I’m presuming is from the movie that helps keep you interested in the story and gameplay. Needless to say, both graphics, sound and gameplay come together well. 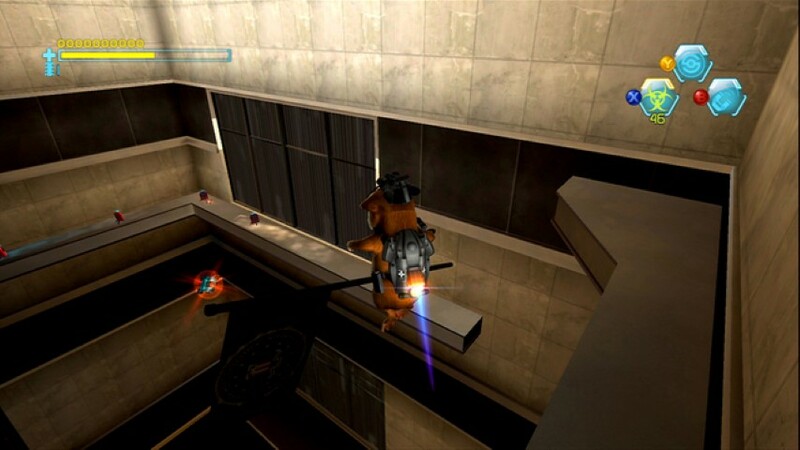 In conclusion, G-Force doesn’t push the envelope in terms of technological advancement or new gaming innovations, however where it does succeed is through its gameplay. The gameplay, although easy for older gamers would be perfect for the younger generation and rather than just skimp on another movie port, the developers have actually put some forethought into the creation of the game. Definitely recommended for the younger gamer from the decent gameplay and is extremely kid friendly.